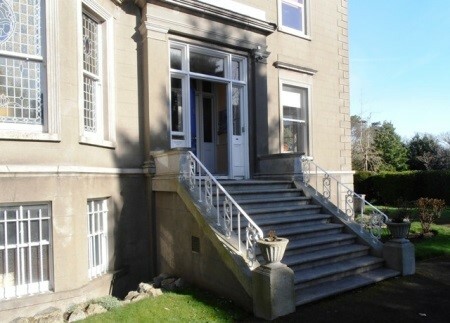 Dún Mhuire was established in Killiney, Co. Dublin in 1945 as a house of studies, a friary with a specialised apostolate in the fields of Franciscan history and Celtic studies. 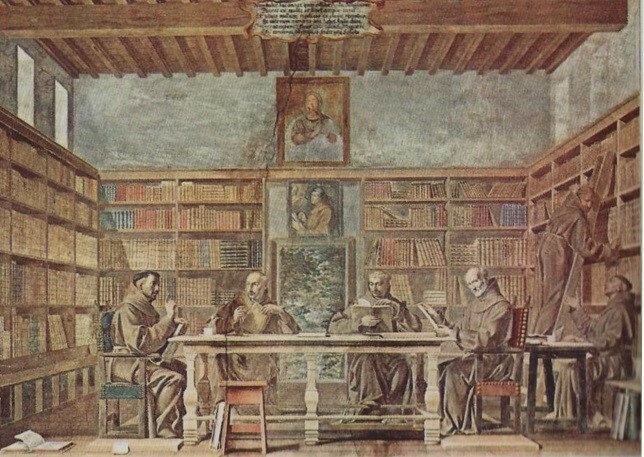 The Franciscan Order has a long tradition of scholarship. Its Irish Province, founded in 1230, has a tradition which is very distinctively Irish as well as Franciscan. Due to war, persecution and confiscation Irish Franciscan scholarship had its base overseas from the beginning of the 17th century, especially in St. Anthony’s College, Louvain from 1607 and in St. Isidore’s College, Rome from 1625, two great centres of learning and religion to which the Irish Church and the Irish nation have acknowledged their indebtedness. In our Louvain college the great emphasis was on Irish hagiography and the preservation of all existing source material on early and medieval Irish history. In St. Isidore’s College under Luke Wadding’s guidance, the scholarly friars, concentrated on Scotist philosophy and theology, and on Franciscan history. The work resulted in a great collection of manuscripts in Irish and Latin in Louvain, and in Latin only in St. Isidore’s. After some, at times heroic, attempts to save them for posterity, many of these manuscripts came eventually to the library at Dún Mhuire. Fr. 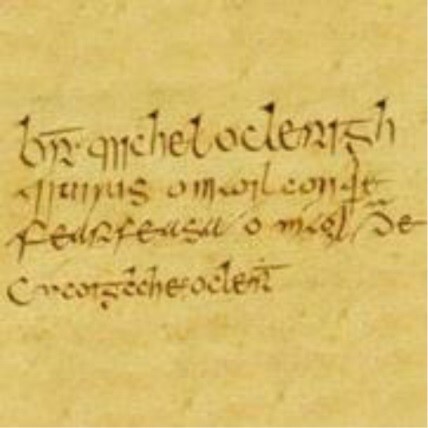 Hugh Ward arranged for Brother Michael O Cléirigh to return to Ireland from Louvain in the autumn of 1626 to collect or copy ancient manuscripts for the Louvain Project. During those unsettled years of hopes and fears, the friars of Donegal in their place of refuge by the River Drowes acted as hosts to the Four Masters. Here Michael O Cléirigh came each winter. The friary held one of the most precious collections of manuscripts in Ireland. The Franciscan Library, Killiney, is part-heir to this library of Donegal friary, which then held the (MS A2, late 11th century) (A3, 12th century), or martyrology of Cat hal Maguire (A7, 15th century), and an excellent contemporary copy of Geoffrey Keating’s (A14). These together with other manuscripts and ones copied by O Cléirigh, and especially the famous (MS A13) which he and his helpers compiled there, were then taken by him to Louvain. The work at Louvain resulted in a great collection of manuscripts in Irish and Latin. It remained intact until the French confiscated the college on 21st January, 1793. In the previous summer some friars took a number of the most valuable manuscripts to St. Isidore’s, Rome, for safety. The holdings in our Roman archives were hidden and saved in 1798-99 when the French occupied Rome, but during the second occupation (1810-14) they were confiscated and removed to Paris, with other libraries and archives. In 1817 they were returned, with some valuable manuscripts missing. Eugene O’Curry and other scholars were interested in the manuscript sources of early Irish history. Attempts were made in 1843 to have the Irish manuscripts transferred from St. Isidore’s to the Royal Irish Academy in Dublin, and in 1859 the Catholic University, Dublin, expressed an interest in them. The friars successfully resisted these moves. Rome was captured by the new Italian government in September 1870 and the Papal States ceased to exist. The British government reacted quickly to save English, Scottish and Irish colleges and houses from confiscation. Because there was reason to fear that the manuscripts at St. Isidore’s would be seized and perhaps destroyed, our friars took the initiative. Thanks to Fr. Luke Carey’s efforts, some of the valuable holdings – Irish manuscripts, Wadding’s correspondence, other papers and medieval codices – were transferred to our Dublin friary in 1873. Bernardino dal Vago da Portogruaro, the Minister General, when granting his permission, stipulated that the manuscripts were to remain in the custody of the Irish Franciscans, and not to pass into secular control. During World War II, they were removed from Dublin, by order of the de Valera government, to save them from possible destruction and the manuscripts were kept in Multyfarnham friary, 1940-45. In 1946 they were transferred to a permanent house at Dún Mhuire which the Minister Provincial, Evangelist McBride (later Bishop) had founded in 1945. The provincial library, specially assembled at Merchants’ Quay by Fr. Canice Mooney, was also moved to Killiney. 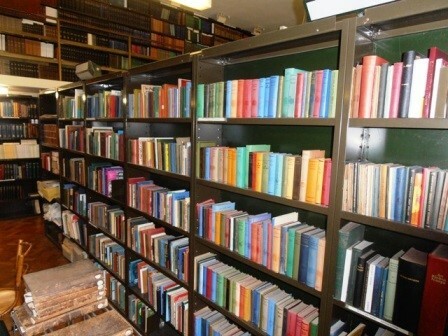 A modern library and manuscript room was built in 1955-56 and the library holdings were enriched with rare books from friaries of the Province. The catalogue of books was computerised in 1990-93. Detailed catalogues of manuscripts A and B have been published. In recent years, however, as the number of friars available to continue the specialised work in Dún Mhuire decreased, it was decided to enter a special agreement with the National University of Ireland, Dublin (UCD). By the terms of this agreement the more precious of the manuscripts and incunabula were transferred to UCD, while remaining the property of the Franciscan Order. UCD undertook to be responsible for the preservation and conservation of the collection, with a view to its availability to scholars in due course. Mícheál O Cléirigh Institute for the Study of Irish History and Civilisation, University College Dublin, was set up in 2000 as part of UCD-OFM Partnership. See website link below.